Hi-Tec is not a brand most Indian trekkers are familiar with. Founded in 1974, Hi-Tec is a privately held company based in Netherlands with a presence in over 85 countries. They make shoes and boots for many sports disciplines including squash, golf, trekking and mountaineering. Hi-Tec India markets the Alpha Trail Mid WP as a multi-sport boot. These boots are imported in India by Extreme Adventure Sport. This is a mid-weight, three season, mid-cut boot with a leather upper. It’s Unique Selling Point (USP) is that it is the only boot in India with a Vibram sole that retails for under Rs. 5000. The thing to understand about Vibram is that it is not a material, its a brand. In other words, Vibram is a company that has been making boot soles for mountaineers since 1937. Up until the 1930s, mountain climbers had to put up with rather primitive hobnail climbing boots. The leather soles on these things were mighty slippery, so they pounded some hobnails into them or attached cleats, and that’s what gave them grip on slick terrain. In 1935, the deaths of six of Vitali Bramani mountaineering friends in the Italian Alps was partly blamed on inadequate footwear. The tragedy drove Bramani to develop a new climbing sole. Two years later, he patented his invention and launched the first rubber lug soles on the market with a tread design called the "Carrarmato" ("tank tread"), with the financial backing of Leopoldo Pirelli of Pirelli tires. The sole was designed to provide excellent traction on the widest range of surfaces, have a high degree of abrasion resistance and was made using the latest vulcanised rubber of the time. In 1954, the first successful ascent to the summit of K2 was made by an Italian expedition wearing Vibram rubber on their soles. The word ‘Vibram’ comes from the ‘Vi’ of Vitali’s first name, and the ‘Bram’ of his last name. We ordered our pair of boots from Amazon India for Rs 4450. A first look reveals a well-made boot with reasonable yet not exceptional levels of finish. Out of the box, these boots have no frayed stitching or scuffs. Nevertheless, the glue that holds the outsole to the shoe upper is smeared along the shoe upper. It may be a cosmetic niggle yet, Decathlon’s Forclaz 500 (2016 model) which retail for about the same price is finished better. A well padded yet flexible tongue that stays flush against the ankle joint. We dislike an overly padded tongue that creates a gap between the ankle and the boot. Aggressive dry traction for steeper slopes, soft dirt, grass and leaves. The Alpha Trail is not a good choice if you want a generously cushioned or a protective shoe over hard and rocky surfaces or if you need a supportive or corrective build. The boot’s utility is limited on a hot summer day as the Dri-Tec membrane in conjunction with a closed toe box and small mesh panels don’t vent perspiration well. 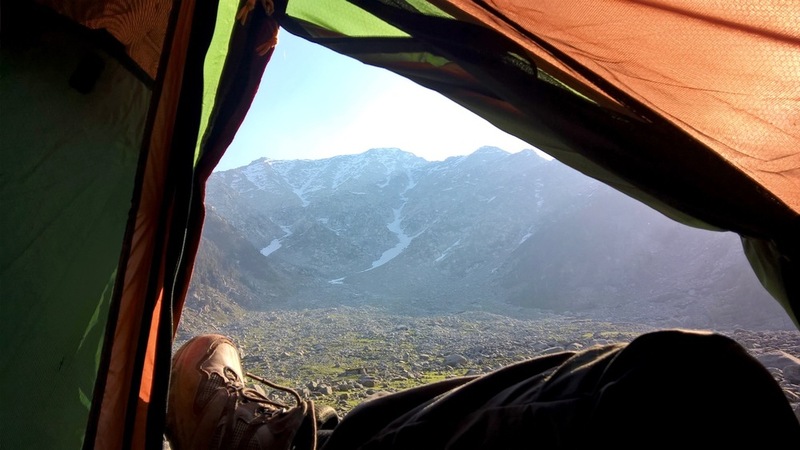 Personally, the Alpha Trail has found a place in my shoe drawer for short, one to three-day mountain treks especially when the trails are soft or slushy. Yet for more technical trails or on longer multi-day backpacking trips, I generally prefer boots with less flex, and more midsole cushion. Among other shoes that we own, the Alpha Trail resemble Decathlon’s Quechua Forclaz 100 the most. Both boots are geared for a similar role and share a similar profile. We tested Alpha Trails in the Dhauladhars during May in dry weather on packed mud, leaf covered and rocky trails. We covered over 150 kilometres in these boots on elevation ranging between 1800 and 3200 metres. 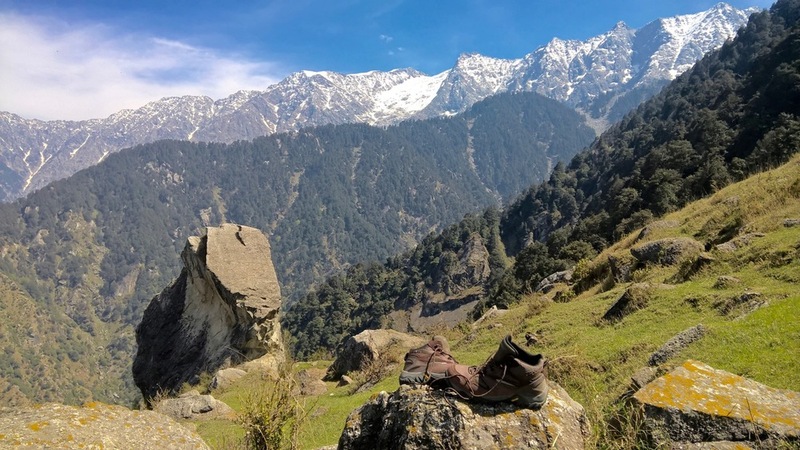 In our quest to find the best viewpoints over and around Mcleodganj, these boots impressed us with their excellent traction and grip over dry surfaces. However, on Guna temple trek and Kareri lake exploration we were hampered by a lack of breathability that left our feet wet and clammy. This poor breathability may be caused by a closed toe box design coupled with small mesh panels and Dri-Tec membrane and we need to explore this in more detail. No-one wants to see ugly feet. But here is how our feet looked after a trek back from Kareri lake on a hot summer day. 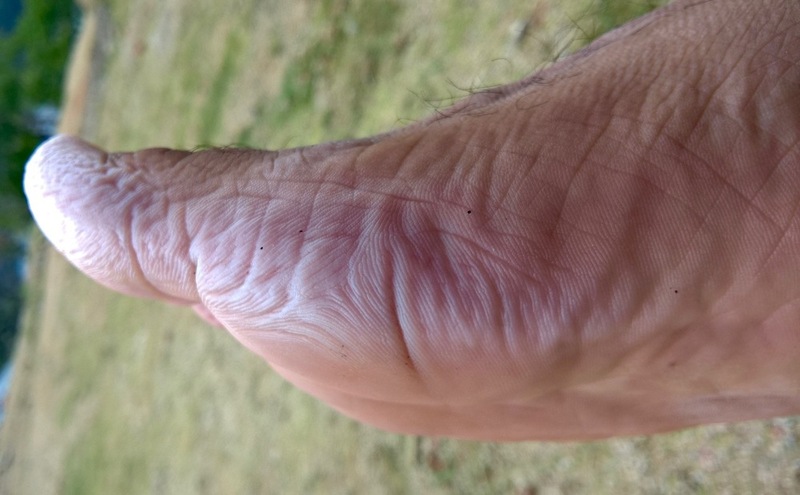 Note the lack of breathability creating white, clammy and blister prone skin. The leather upper is extremely robust and resists abrasion well. After 150 kilometres, over rocks, the leather and synthetic upper is good as new. The Vibram outsole is a softer rubber compound than what we find on most Indian trekking shoes. This makes them trip well but the effect of using a softer compound on longevity still remains to be seen. We haven’t been able to test the nature of their proprietary waterproof Dri-Tec coating yet. Nonetheless, we will take these boots out on treks in the monsoons to see how well they cope in a Himalayan downpour. HI-TEC® ALPHA TRAIL MID WP in the Dhauladhar mountains at 3200 metres. We will eventually write a review based on long-term use, which reveals much more than a few outings ever will. However, that will take time. If you have any questions about these boots, or if you would like to suggest a testing strategy let us know in the comments section below.